It is often useful to analyze equipment performance based on fluctuations in key variables of plant operation. For example, performing a capacity rating study on a gas plant will help to determine the effect of additional inlet gas on plant equipment. In some cases, it may be necessary to analyze the effect of many different changes to key variables. Creating a list of key performance indicators (KPI) is a clear and logical way of determining these effects. There are multiple ways to view the KPI of a process using simulators. This article will briefly describe some of the methods available to the user. Copy/Paste Method: Use the copy/paste method to manually transfer KPI results from HYSYS into an Excel spreadsheet. This method is tedious for even moderate amounts of data. In general, except for small amounts of data there are better ways to set up the KPI. Aspen Simulation Workbook1: Aspen Simulation Workbook allows users to create an interface between MS Excel® and HYSYS process simulations without any programming. The Scenario Table feature allows users to run numerous scenarios through the model in order to check design cases, perform sensitivity analysis and analyze historical data. The Simulation Workbook allows users to develop dynamic models, displaying the model results in real time. Note that this tool comes with an associated cost (as opposed to the other methods listed here). HYSYS Stream Reporter / HYSYS Browser: Stream Reporter2 is a utility that exports stream conditions, properties and compositions from the simulator into MS Excel. Stream Reporter can report properties for streams that are vapour, liquid, aqueous, or combined liquid-solid phases. Users have the ability to fully control what properties are exported to HYSYS. HYSYS Browser3 is a legacy HYSYS/Excel linking tool that has been phased out by Aspentech (i.e., the documentation hasn’t been updated since 2004). HYSYS Browser allows data to be transferred both from Aspen HYSYS to MS Excel and vice-versa. Case Study Tool: This tool is used to monitor the response of key process variables based on changes that occur in the steady state process. This is done by selecting dependent and independent variables for each case study, and tracking the response of the dependent variables to controlled changes in the independent variable(s). Changes in the independent variables are controlled by selecting an upper limit, lower limit, and a step size, which determines the number cases run by the tool. It is possible to add as many independent variables as you like; however, only two can be plotted at one time. Because of this, and in order to minimize the time it takes to solve the case study, it is wise to limit the number of independent variables to two. Once the case study has been solved, results can be examined in either a plot or table. Plots involving two independent variables result in a 3-dimensional graphical representation. 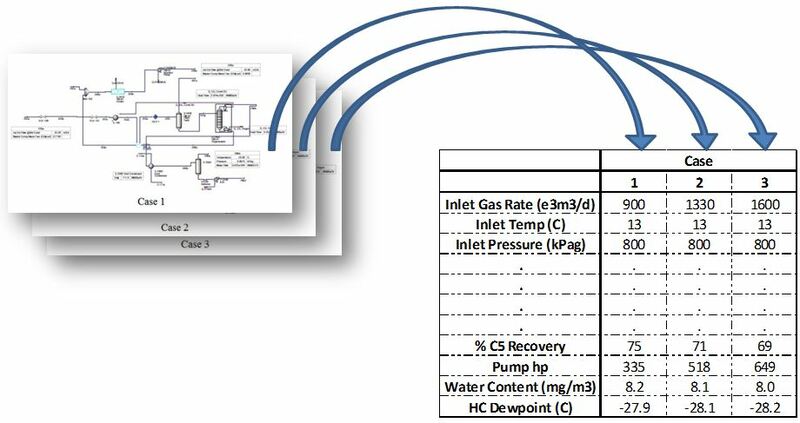 Case Study Results: Compressor power and discharge temperature as a function of suction pressure. HYSYS/UniSim Spreadsheets: Spreadsheets can also be set up directly in Aspen HYSYS and Honeywell UniSim, in order to view KPIs. Data can be imported from material and energy streams directly into the spreadsheet. Formulas can be entered which reference cells containing data imported from the process. The simulator spreadsheet resembles MS Excel in appearance; however, when it comes to being user-friendly there is much to be desired. For example, in the HYSYS spreadsheet, users must specify the number of rows and columns in the table (the default is 10 rows and 4 columns). Once data is entered rows and columns cannot be inserted in between current data. If users want to insert data between rows or columns they will need to retype all the data again. There are a variety of ways users can keep track of key performance indicators calculated in the simulation software. The choice in method will be determined by the size of the project, the number of variables to be tracked and whether or not the user wants to pay for software licensing. Note: An Aspen support account is required to access the Aspen Knowledge Base.